Beneath a Scarlet Sky by Mark Sullivan tells the amazing true story of an 18-year-old Italian boy named Pino Lella. This novel is very much a coming of age story as it is a story of WWII. Pino comes of age against the disturbing back drop of war, which drastically shapes the rest of his life. Despite that fact, Pino’s unbelievable story went untold for nearly 70 years. As Sullivan notes in the novel’s intro, many veterans refrain from speaking about their war time experience as a way to move forward and heal, however, many heroes have also gone unnoticed because of this. Pino was one of them until Sullivan heard his tale, by chance, and followed it through with research trips and several interviews with Pino himself. Pino is one of those people who continually gets drawn into extraordinary events and meets prominent historical people. I’ve found that some people are just magnets for that, and Pino certainly was. Pino was living in Milan with his family when the war came to northern Italy. After narrowly escaping a bombing of a movie theater, Pino and his brother are sent to the Casa Alpina (a Catholic boys school) in the Alps. Recognizing his passion to do something, Father Re of Casa Alpina soon enlists Pino (and eventually his brother Mimo) in guiding Jewish refugees through the treacherous mountain passes into the safety of Switzerland. Although still a teenager, Pino continually makes the dangerous trips through the mountains to guide people with little to no training in mountain climbing and hiking. Throughout the novel, young Pino is continually asked to do grave and extraordinary things and he excels at them all: first helping in the Catholic underground railroad, and then back in Milan as a driver for Nazi General Hans Leyers. Although Pino is disgusted by enlisting with the German Army, he is convinced to do so by family members who tell me he will be a spy for the Allies. At only 18, Pino is asked to sacrifice again and again and to make moral and ethical decisions on a daily basis at the risk of his own reputation and safety–not to mention that of his family, friends, and his love, Anna. When we think of our own selves as teenagers, it’s hard to imagine achieving as much Pino. But then again, the dark circumstances of the world asked this of him and he responded–bravely and passionately. What makes Beneath a Scarlet Sky a even more fascinating read is the fact that it is true. For one person to have experienced so much life at such a young age, only to keep it inside for so many years, is breathtaking. Not only was Pino’s story compelling, but the novel also provided great factual backdrop and context for the plight of Italy during WWII. As Sullivan notes in the intro, what happened in Italy and to the Italian people isn’t often spoken of. In turn, I learned a lot more about what Italy was experiencing at the time and even though Mussolini was allied with Hitler, the Italian people were very much victims of the Nazi occupation. I was also not aware of the Catholic underground railroad in the Alps to bring Jewish refugees to safety, which illustrates a level of religious tolerance that some might not expect for that period, or of the Catholic religion. 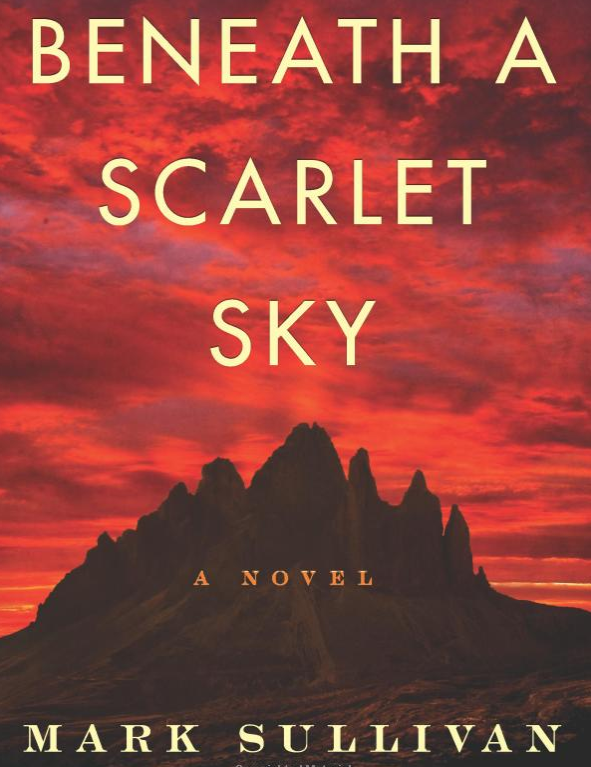 Beneath a Scarlet Sky will soon be adapted for the screen with Tom Holland playing Pino Lella. This was one of my favorite reads of 2017 and I kept wishing more people would see how wonderful this story was!